I've owned this set since it was issued, first on LP, now on CD, and it's one of my favorites. Vishnevskaya is indeed past her prime, but even in her prime, her vocalism was never ideally steady, and even at this late date, her delivery screams "DIVA", which is what Tosca must be, first and foremost. Bonisolli never gets much respect - he was apparently more than a little crazy, even by tenor standards of behavior - but it's a real voice, and he's on his best behavior. Better to have Bonisolli on his best day, fully committed, rather than the always competent but generic Domingo. Best of all is the criminally underappreciated Matteo Manuguerra, who is the best Scarpia on records. He may not snarl like Gobbi, but he has twice the voice, and plenty of interpretive and musical skill. ^^^ Though I can't share your enjoyment of an over-the-hill Vishnevskaya (who really was extraordinarily fine in her prime, ideally steady or not), perhaps Manuguerra would redeem the production for those who, like me, consider Scarpia the most interesting character and true center of the opera. It's really only the dramatic creativity and magnetism of Callas and Gobbi in the Covent Garden production that have induced me to return to Tosca over the last few decades, except for purposes of comparison (in which all other performances come up wanting). I have to agree with Callas that Tosca is not an interesting woman (which, she said, is why she worked so hard to excel in the part), and Puccini certainly makes next to nothing of Cavaradossi. On the other hand, Scarpia is gruesomely compelling, and his spirit (if that's the right word) pervades the work from beginning to end. I agree with Joseph Kerman that Puccini should not have brought back the tune from "E lucevan le stelle" at the end - a cheap gesture of pathos - but should have kept the focus on Scarpia and the triumph of evil. He didn't repeat the mistake in Madama Butterfly, where he could have made a sentimental gesture but went with the shock and horror of Butterfly's death and Pinkerton's discovery of the meaning of what he had done. 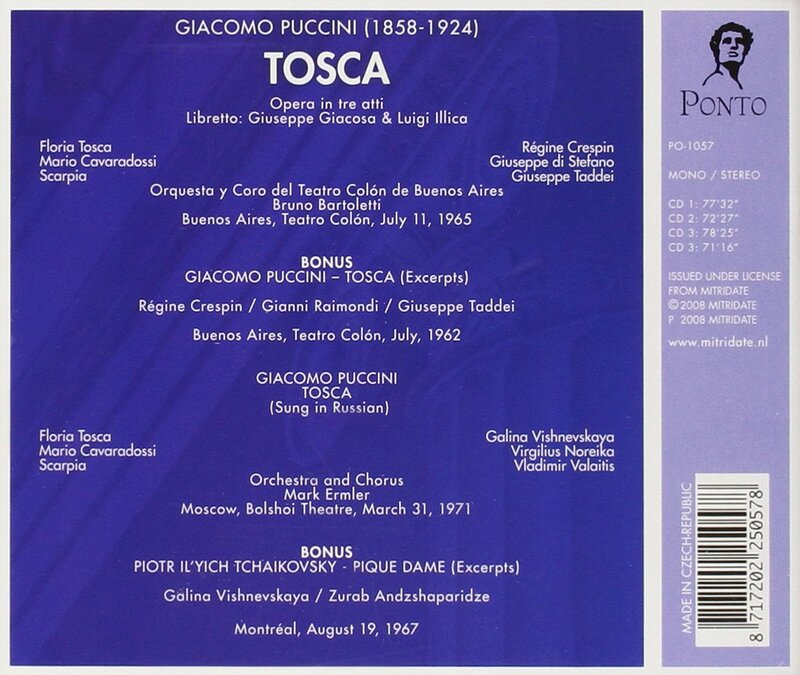 Regardless, I would buy the Vishnevskaya Tosca in a heartbeat if I could find a cheap copy. Hey, is that one sung in Italian? I know there is another Tosca recording with her that is sung in Russian. That would be weird. IIRC, the Russian one has Milashkina, Atlantov, and maybe Chernov, Ermler conducting. The Vishnevskaya is in Italian. BTW, the Vishnevskaya is on Spotify. Last edited by wkasimer; Nov-13-2018 at 19:12. Last edited by Fritz Kobus; Nov-13-2018 at 20:19. That Russian recording is a different one, which I didn't realize had seen the light of day commercially. Worth hearing for Noreika, a fine and underappreciated (hell, virtually unknown) tenor. Last edited by wkasimer; Nov-13-2018 at 20:35. My memory was faulty. This is sung in the original Italian, not in Russian. This is one of the three Toscas that I keep on my shelf. I keep it for Carreras' Cavaradossi, recorded a year or two before his voice began to deteriorate. The other two are De Sabata (for Callas) and the Rostropovich (for Manuguerra). All times are GMT +1. The current date and time is Apr-25-2019 16:50.